You are running a little behind today, so breakfast was just a drive-thru coffee and a smile from the cashier, but now it is lunchtime, and you are STARVING. You make your way to the deli down the street from your office, get a sandwich, and you just cannot wait for that first bite. As soon as you take it, you are filled with a feeling of…pain? 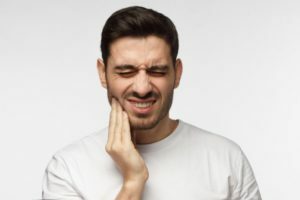 A sudden pain shoots through one of your teeth, and automatically your mind is filled with questions like, “What is causing this?” and, “How can I make it stop?” Read on to learn about the top 3 reasons for tooth pain in Williamsville as well as what you can do about each. That is right! Cavities are by far the most common cause of dental pain across the globe. Brought on by a lack of consistent oral hygiene, they are the result of the plaque and bacteria in your mouth breaking down the enamel. If you suspect that your pain may be due to a cavity, your next call should definitely be to your dentist in Williamsville. Cavities only tend to get worse if left untreated, and there is next to nothing you can do about one at home. Thankfully, your dentist will likely be able to quickly repair it with either a filling or crown. Teeth can become cracked because someone has been in an accident or they have bitten into an extremely hard piece of food. Most of the time, these cracks cannot be seen by the naked eye, but they can certainly be felt! If you feel a sharp pain whenever you bite down on a certain tooth, a crack is likely the culprit. You should contact your dentist right away, because much like a cavity, a crack will only get worse over time, and you cannot really treat it at home. Does your dental pain only occur when your teeth are exposed to hot or cold foods/beverages? Most of the time, this kind of dental sensitivity is due to a slight thinning of the enamel, leaving the delicate internal nerve more exposed. If the sensitivity stops as soon as the food/beverage is out of your mouth, then it is not too big of a deal, but if the pain lingers, it is best to call your dentist, as this could be the sign of a bigger underlying problem (such as an infection or crack). Brush and floss your teeth every day to prevent cavities and other oral infections that can lead to pain. See your dentist at least twice a year for checkups and cleanings so a dental problem cannot sneak up on you. Do not chew on hard items like ice, pens, pencils, fingernails, rock candies, etc. If you have sensitive teeth, consistently brushing with a dedicated sensitive-tooth toothpaste can help lessen the discomfort. While dental pain is very common, by taking care of your teeth at home and contacting your dentist at the first sign of a problem, you can make sure that your smile stays strong, beautiful, and pain-free for many years to come. Dr. Lee Shainbrown is a graduate of the SUNY at Buffalo School of Dental Medicine and currently serves the Williamsville community at Amherst Dental Group. There, he and the rest of the team provide a comprehensive array of general and specialized dental services for patients of all ages. If you or a loved one are currently experiencing any kind of dental pain, he is ready and able to help, and he can be quickly reached through his website.